Again, for session III, the armchair offered itself wonderfully to us as a great reference object, the perfect element to work with! Brown, mobile (on wheels), and by the look of it, gone through a bit in its lifetime. Kim is wearing: Jean shorts (no brand from a flea market in Berlin); A purrp geometric lines top (Vintage Mallani); Purrp tights (funny enough, new from a flea market in Andalusia); Collar necklace (Turkish clothing shop in Berlin); Brown patent leather shoes (Tupage). Oh!!! And the pink stuff on my head is, as probably a couple of you have guessed, a pair of pink tights. I used to love to make headbands out of old colourful tights as a kid. Have a great Sunday and a fantastic start to the week! thanks so much!!! 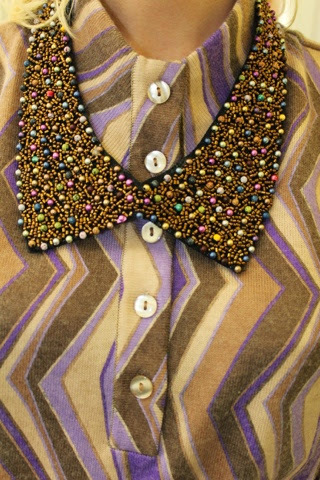 yeah...the blingy collar is magic!